First peal at first attempt: 1. 100th peal together: 2 and 4. Especially arranged and rung as an 18th birthday compliment (today) to Ben White-Horne. The band after the peal. 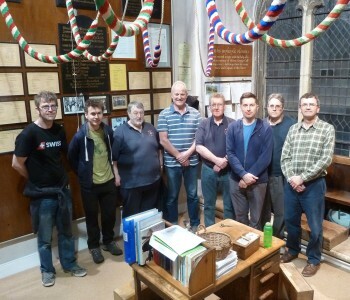 Left to right: Phill Payne, Ben White-Horne, John Cornock, Tony Bulteel, Ian Unsworth, Gareth Lawson, Andrew Bull, Andrew Ward. Last updated Tuesday, 17 April 2018 at 18:32:36. First submitted Monday, 16 April 2018 at 21:51:07 by Andrew M Bull. Sent for publication in The Ringing World on Monday, 16 April 2018 at 21:52:51, and printed in issue 5584, page 428.